This Working Paper focuses on transporters, i. e. hauliers, as important actors in the border areas between Afghanistan and its neighbours Pakistan and Iran. The transport sector is sensitive to market fluctuations and a volatile business environment, reacting strongly with increasing or declining employment. This study addresses the question of how haulage companies and workers operate in an insecure environment as found in the border areas of FCAS and identifies strategies for conflict-sensitive employment. 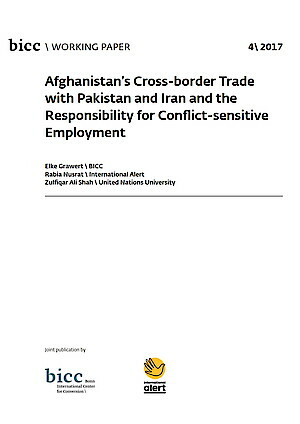 Based on the analysis of academic studies, bilateral treaties and their implementation, media reports and interviews with owners and managers of haulage companies and small hauliers, drivers and labourers, this Working Paper presents the particularities of formal and informal trade in the border areas of Afghanistan. A major finding is that states, large companies, small transporters and workers greatly differ in their perceptions of violent conflict, which range from views of alarming insecurity to regarding it as negligible. Moreover, businessmen tend to perceive corrupt practices by state officials and the police as a source of more uncertainty than acts by non-state armed groups. A third insight is that Pakistan and Iran consider cross-border trade with Afghanistan a minor issue as both states are pursuing particular interests in the larger region. Pakistan’s tense relationship with India and Iran’s struggle with Western sanctions inform the trade strategies of these countries, while Afghanistan is a marginal player in these power struggles. Some conflict-sensitive employment strategies, such as employing drivers and assistants according to cultural criteria to facilitate safe passage through areas under the control of various power holders and affected by violent conflict are adopted by cross-border haulage companies out of self-interest. The paper presents additional strategies that major companies can use.